It costs a lot to communicate with people. If you have to pay a lot for each set of impressions that lead to a sale, then you risk having a high acquisition cost-per-customer (CPC). Here are some examples of how to keep costs low and maximize the impact. Low Incremental Cost. The best way to keep acquisition cost low is to leverage a medium that has very little incremental cost per impression, ie, it doesn’t cost you anything to create more impressions. For example: email. It’s one of the most efficient media there is because you don’t have to lick any stamps, stuff any envelopes. Of course, you will need email addresses and permission to send periodic messages. Another way is building and vehicle promotion, ie, signage and vehicle branding. If you’ve got vehicles, you own one of the most leveragable forms of promotion around: a moving billboard you already own. So just by driving around, you can get thousands of impressions with no incremental cost, as long as you treat it as a promotional message, not just identification. A second way to leverage your promotion is to use a call to action. A call to action is simply a line on all of your materials that suggests what you want the prospect or customer to do when the have an interest. 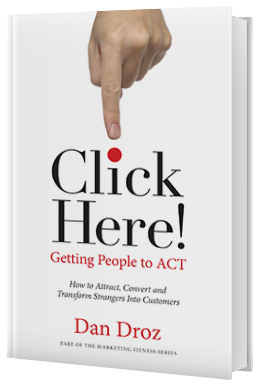 On an email, a call to action is a button that says click here for a free guide to…whatever you’re selling. On an ad, it might be a coupon or a phone number to call for a free guide.